Converts 12V DC to 230V AC and has reverse polarity protection. Designed to be hard wired into 12V supply. Fitted with a USB port for charging mobile phones and MP3 players etc. 1000W continuous power. Engine single cylinder, 4T forced air cooled. Takes 12V DC from a vehicles battery and converts it to 230V AC. used with appliances that have 3 pin UK-type plugs. Fitted with a USB port for charging mobile devices this makes the chargers flexibility ideal for use in caravans, boats, HGVs etc. For safeguarding appliances, the unit is fitted with an overload alarm and reverse polarity protection. Display packed. 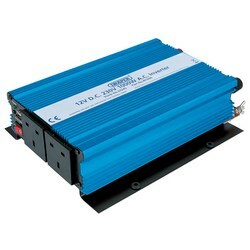 A power inverter that converts 12 Volt power to 230V AC 50Hz. This power inverter connects directly to a cigarette lighter and in continuous use provides 150 Watts. This is a modified sine wave inverter, so is ideal for everything except capacitive loads (such as fluorescent lighting), for these it would be best to use a pure sine wave inverter. The Sun-150 150 Watt 12 Volt power inverter has fuse protection. The power inverter's peak power output is 300 Watts and it will run at 150 Watts continuously. Do not use a modified sine wave inverter with fluorescent lighting! 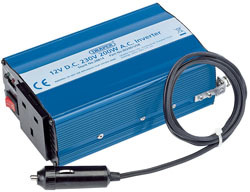 This Skytronic power inverter converts 12 Volt power to 230V AC 50Hz. 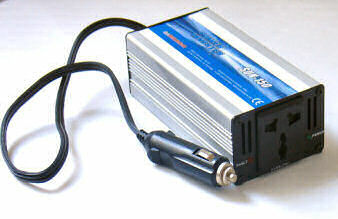 This power inverter connects either to a cigarette lighter or directly to the vehicle battery via jumper leads (supplied). In continuous use, and connected directly to the battery, it provides 300 Watts. This is enough for electric razors, radios, Ghetto blasters, CD players, games consoles, air purifiers, notebook computers, portable TVs and Hi-fis (check rating to be sure), etc. This is a modified sine wave inverter, so is ideal for everything except capacitive loads (such as fluorescent lighting), for these it would be best to use a pure sine wave inverter. The Skytronic 300 Watt Soft Start Power Inverter has stabilized output voltage and short-circuit and overload protection with LED fault indicator. The Power inverter is soft start, which protects attached equipment from surge. Do not use a modified sine wave inverter with fluorescent lighting! 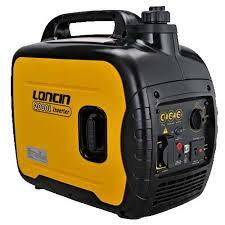 Do not use a modified sine wave inverter with AC/DC power tool chargers! 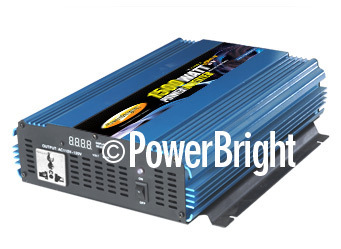 The Sun-800 1200W Power Inverter will power mains AC equipment from a 12V vehicle battery. 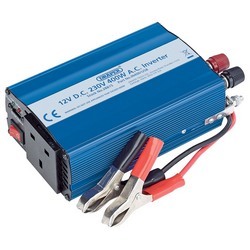 The 12v 800W Power Inverter has two AC sockets is an ideal leisure accessory and is safe to use on equipment rated up to 800W including medium power tools, colour televisions with DVD players, low wattage microwave ovens etc. This is a modified sine wave inverter, so is ideal for everything except capacitive loads (such as fluorescent lighting), for these it would be best to use a pure sine wave inverter. It is a modified sine wave output inverter with reduced noise on output, so it is suitable for most electronic apparatus. For short periods of time (on startup) the Sun-800 will output up to 1600 Watts. This is to account for the startup surge you get with many appliances. With under voltage, over voltage and over load protection built in. In particular, the inverter senses when the battery is low and switches itself off, this is to protect the batteries from being completely flattened. Comes with round end connection leads. Do not use a modified sine wave inverter with fluorescent lighting, the capacitive load may damage the inverter. The Power Bright ERP1100 is a power inverter that converts 12 Volt vehicle battery power to mains 220V-240V AC 50Hz. 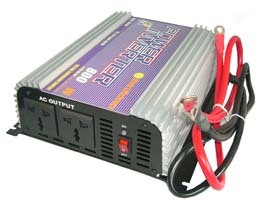 The Power Bright ERP1100 power inverter connects directly to the battery (connection lead supplied) and in continuous use provides 1100 Watts. This is enough for a portable or main TV, all types of electronic games consoles, low and medium and high wattage power tools, most microwave ovens, video camera, etc. The Power Bright ERP1100 1100 Watt 12 Volt power inverter has fuse protection, over temperature protection and an alarm and safety cut out designed to stop you flattening your vehicle battery and is fan cooled to prevent overheating, The power inverter's peak power output is 2200 Watts (this is to account for the start up power surge that many appliances have when first switched on) and it will run at 1100 Watts continuously. Do not use a modified sine wave inverter with fluorescent lighting, the capacitive load may damage the inverter. The Power Bright ERP3500 is a power inverter that converts 12 Volt vehicle battery power to mains 220V-240V AC 50Hz. 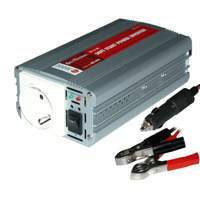 The Power Bright ERP3500 power inverter connects directly to the battery (connection lead is not supplied) and in continuous use provides up to 3500 Watts of power. This is enough for a portable or main TV, all types of electronic games consoles, low and medium and high wattage power tools, most microwave ovens, video camera, etc. This is a modified sine wave inverter, so is ideal for everything except inductive loads (such as fluorescent lighting), for these it would be best to use a pure sine wave inverter. The Power Bright ERP3500 3500 Watt 12 Volt power inverter has fuse protection, over temperature protection and an alarm and safety cut out designed to stop you flattening your vehicle battery and is fan cooled to prevent overheating, The power inverter's peak power output is 7000 Watts (this is to account for the start up power surge that many appliances have when first switched on) and it will run at up to 3500 Watts continuously. 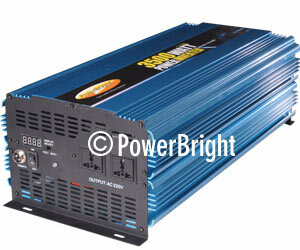 The Power Bright ERP6000 is a power inverter that converts 12 Volt vehicle battery power to mains 220V-240V AC 50Hz. 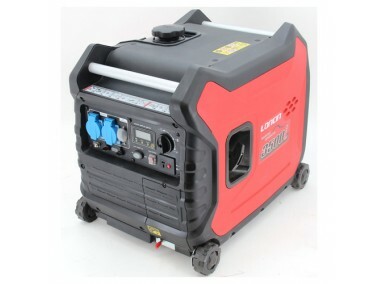 The Power Bright ERP6000 power inverter connects directly to the battery (connection lead is not supplied) and in continuous use provides up to 6000 Watts of power. This is enough for air conditioners, heaters, portable or main TV, all types of electronic games consoles, low and medium and high wattage power tools, microwave ovens, video camera, etc. This is a modified sine wave inverter, so is ideal for just about everything. The Power Bright ERP6000 6000 Watt 12 Volt power inverter has fuse protection, over temperature protection and an alarm and safety cut out designed to stop you flattening your vehicle battery and is fan cooled to prevent overheating, The power inverter's peak power output is 12000 Watts (this is to account for the start up power surge that many appliances have when first switched on) and it will run at up to 6000 Watts continuously. The Power Bright ERP6000 must be connected to two 12 Volt batteries - if both sets of connection are not used you risk damaging the inverter! Do not use a modified sine wave inverter with fluorescent lighting, the capacitive load may damage the inverter. This inverter does not come with connection leads, mainly because every customer seems to need leads of different lengths.